Senior Director SAP Co-Innovation Lab Sinan Tumer is the Senior Director of SAP Co-Innovation Lab in the East Coast region of USA. He is responsible for establishing an open innovation process by harnessing SAP’s partner ecosystem to deliver innovative business solutions to SAP’s customers. Previously he was responsible for managing international research policies at SAP Research with special focus on Research & Innovation deployment and early adoption programs of the US and EU governments. During his long career at SAP America, he held various management positions like Director of Operations at SAP Research, Consulting Director of the US North East region and Software Partner Alliance Director. Prior to joining SAP, he had held various IT management positions at various Consumer Goods companies and Systems Integration consulting positions at Andersen Consulting and Price Waterhouse. Sinan has a Master degree in Systems Engineering and a Master of Science in Computer Sciences, both from Georgia Institute of Technology. Why is innovation topic important? What is this hype around it? It is important for governments because innovation drives economic growth, job creation and social impact. It is important for the industry because innovation drives revenue growth. It is important for the society because it enables better life for citizens. Something unique happens when human capital and other workplace practices are combined with information technology. By 2020 the Internet will add $3.8 trillion to the global economy- more than the total GDP of Germany. ICT was responsible for 75% of S. productivity growth from 1995 to 2002, and 44% from 2000 to 2006. McKinsey estimates that because of the Internet, 2.4 jobs were created for every 1 job lost. Governments provide 70% of the funding for the first two stages. Third and fourth stages are funded by the industrial investors. In order to real innovation take place, the invention has to be implemented, in other words it has to be taken out of a “lab” environment to the “market”. The 4-step cycle is not straight forward and gets complicated. It is a challenge to transition from the Invention stage to the Innovation stage. There is a “huge” innovation gap which can be called “Valley of Death” with uncertainties and challenging obstacles such as government regulations, lack of investment funds, unclear market benefits or competitive obstacles. Governments can push research funds but unless there is a market accepting inventions, the “innovation gap” will remain. Market demand has to be created for innovative products and services to attract investment funds for innovation. Each of the ecosystem’s “partners” has unique roles to play in the innovation cycle. Universities conduct basic and applied research, develop intellectual capital, but rarely take inventions to the market although recently there are universities supporting startup (spinoff) programs through their technology transfer offices, especially in the US. The role the industry is to take inventions to the market; this is where the economic and the social impact take place. Innovative industries can vary by size, SME, startup, large company with existing innovation infrastructure and university spinoffs. Stakeholders, although they have different goals and objectives, have to work together to get to the “Promised Land” which is a society built upon Innovation Economy, where knowledge is constantly created and economic sustainability is the norm. However it is not a straight forward road to get there, there are barriers on the way! 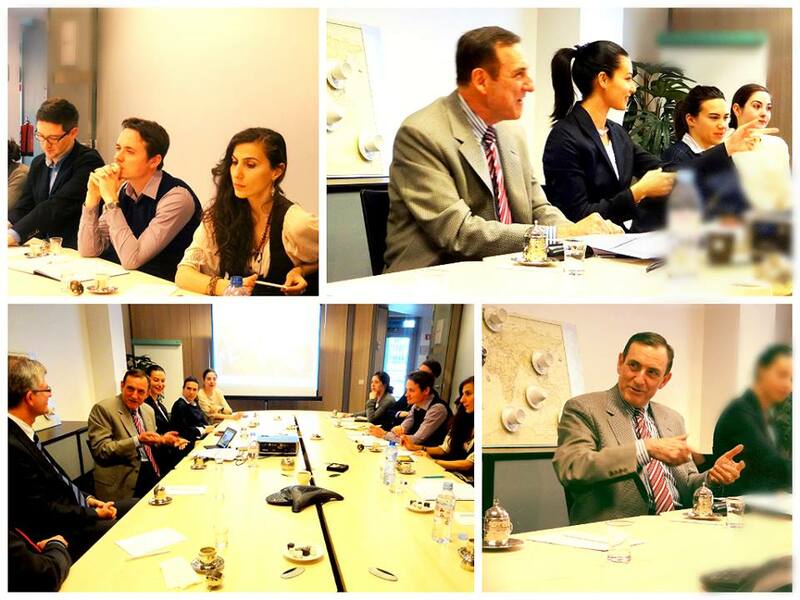 Turkish Coffee Briefings is a roundtable debate club in Brussels. The sessions are introduced by a guest speaker, followed by 45 minutes of exchange of views by participants. Turkish coffee and delights are served. The topics are selected in relation with the current European social, political and economic agenda. Each session may be followed by a short report summarizing the debate points based on the Chatham House rules. The purpose is to create an intellectual framework of debate from a selected group of participants, structured in a way to enable open discussion and stimulate new ideas.